The Kangxi emperor at his writing desk Chinese carpets from the 'classical' period, 1400 to 1750, possess a serenity and balance that are quite unsurpassed. These attributes did not come about purely by chance, but rather through centuries of tradition and refinement. 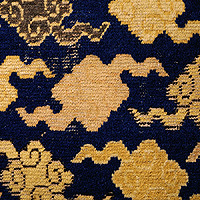 In order to create these beautiful objects, the Chinese master weavers used highly elaborate methods of weaving incorporating a huge repertoire of knotting techniques, far more than in any other carpet-making region. The range of colours and the use of varying shades of each colour were the result of more than two thousand years of usage and development of natural dyestuffs. Carpets are generally considered utilitarian objects and their creation at best a minor craft. Yet, for whole groups of people they were their primary medium of artistic expression. They were not simply an art form but the very essence of the peoples that created them. Their designs, their placement and the combinations of colours expressed a language of symbols that stretched back more than two millennia. These symbols were so fundamental to the existence of the people that they were considered to bestow all aspects of a healthy and fruitful life as well as facilitating a smooth passage of the soul into the next world. 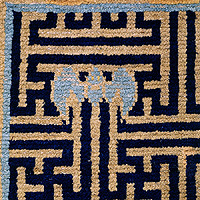 floral carpet (detail) Probably fewer than six hundred Chinese carpets survive today from the classical period. 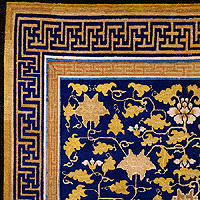 The Palace Museum in Beijing has the largest collection, with fewer than one hundred; the Metropolitan Museum of Art in New York has some fifteen rugs and a similar number survive in The Textile Museum, Washington, D.C. A few other museums possess just one or two examples, often gifts they received by chance. The main body of examples is held in private collections in Europe and the United States of America. They have survived through the foresight, care and connoisseurship of their owners. 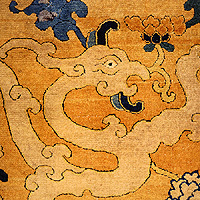 Due to their scarcity, classical Chinese carpets have remained virtually unknown. Their beauty is admired superficially, but their meanings and tradition remain a mystery. It is hoped that through projects such as this, a light can be kindled that encourages others to research the subject more deeply. all text and illustrations © textile-art 2006: not to be reproduced without permission.